The Captain's Handbook is a guide to captaining a vessel, it comes with a pop-up sextant which is a navigation tool useless in space. 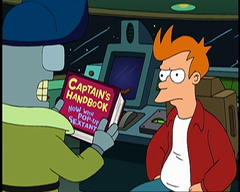 Among the numerous pieces of information provided by the book are Peter Parrot's rules of captaining, the first of which is to "always respect the chain o' command". This book is one of the items from the Professor's tool rack in the game, and is more than likely one of "the ones [he] didn't need".